The Wings' Steph Charbonneau (21) celebrating a goal against the Buffalo Bandits during the Wings' inaugural game since returning to Philadelphia, on Dec. 15. 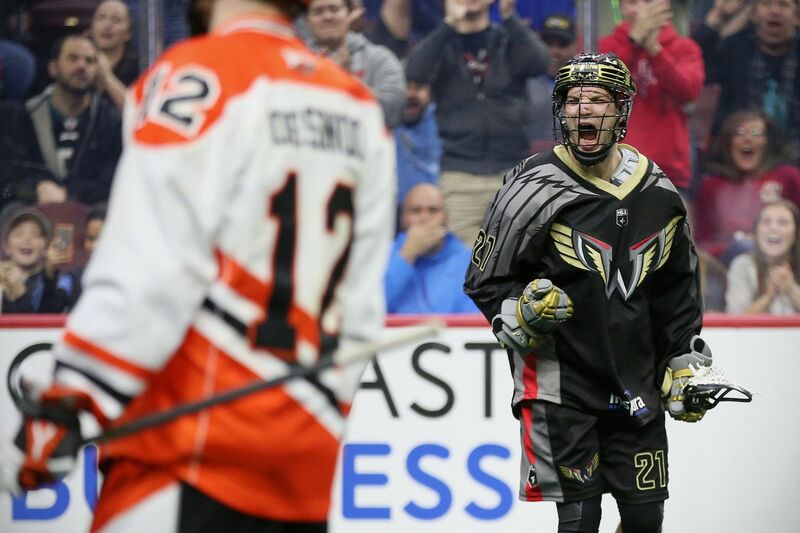 The Wings addressed some early-season concerns over the weekend, when they acquired New England Black Wolves forward Kevin Crowley in the first trade during this National Lacrosse League season. The Wings, who will host the George Swarm at 7 p.m. Saturday at the Wells Fargo Center, have been haunted over the last three games by the first five minutes of play along with an accumulation of penalties throughout. They have not been able to find the back of the net early in games, and what has kept them in those games is a defense led by goalie Doug Buchan (51.0 save percentage). The Wings are hoping Crowley can help solve their offensive struggles. “We’re excited to get him going, and you can bet you will see him during the first shift of the night. That is for sure," Day said. The Wings, who have lost those first three games, acquired Crowley on Saturday for first-round draft picks in 2019 and 2022. Crowley, who lives in Philadelphia and owns a local business, was drafted by the old Wings in 2011 and has been pretty vocal about his desire to play in Philadelphia. It was just a matter of whether professional lacrosse would return to the city, but he is happy to be back, especially during an exciting time for Philadelphia sports. Crowley, who had been holding out and thus has not played in an NLL game this season, hopes he can build on last season’s 51 goals. He has scouted both the Swarm and his current Wings teammates in preparation for Friday’s practice and Saturday’s game. Over these last few weeks, he has tried to simulate an indoor lacrosse game in anticipation of joining a team soon, but he acknowledges it has been nearly impossible to emulate the speed of the game. “It’s going to be interesting this weekend playing in my first game,” Crowley said. Day said the decision to add Crowley to a young offensive group was a “no-brainer.” Conversations about a potential deal began as early as last May, but their urgency increased when Matt Rambo suffered a lower-body injury during practice last Friday and Brett Hickey suffered a season-ending Jones fracture to his right foot Saturday against the Rock. Rambo will be available for Saturday’s game but Day isn’t sure if he will be ready to play. That decision will be made during Friday’s practice. Day feels this year’s draft class isn’t as strong as last year’s, so there wasn’t a huge concern in giving up the 2019 pick. He is looking forward to the development of the players in last year’s entry draft and their maturation over the next three to four years. “We’re really happy with the group we have, and we’re going to build together over three to four years and grow together,” Day said. Going into Saturday’s game against the undefeated Swarm, Day believes the key for the Wings is defense. The Swarm (3-0) sit atop the Eastern Division. Last week against the Vancouver Warriors, Georgia scored two goals in the first seven minutes. Day said the Wings are going to have to outwork the Swarm similarly to how they played last weekend against Toronto when they forced the game into overtime.